Oh Snaps! That's tight...: Lil Wayne - SONS? 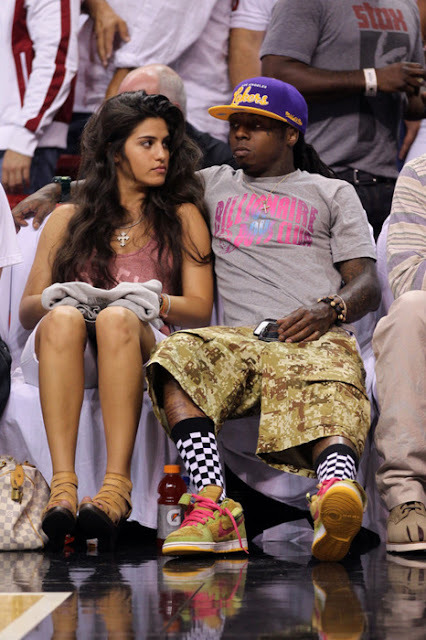 My boy asked me what I thought about Lil Wayne's outfit (pause, no homo, ayo, etc) while sitting courtside at a recent Heat game - and I had no words. I didn't know if I should hate on it for looking like a hodgepodge of items thrown randomly together, or for being too matchy-match and coordinated in a "someone on my team spent 2 hours throwing this look together to make it look like I didn't think about it (there is a lot of subtle matching going on here - Shoes/Shorts, Laces/Font on Shirt, Hat/Font on Shirt, Bracelets/Shorts). Anyway - a couple days ago this same photo popped up on one of my favorite "why am I here? I have a lot of more important stuff I should be doing" sites - aptly called, "Swag or No Swag". Check it.